Answer: They both are. Does that answer surprise you? You're not alone. Many riders don't know what the term "on the bit" really means. If you're like most riders, you probably thought the horse on the right is "on the bit" while the one on the left is not. That is because most riders confuse the terms "on the vertical' and "on the bit". The horse's face in the right picture is on the vertical, with the poll and nose lying on a straight line perpendicular to the ground. Many riders think this is what it means to be "on the bit". The horse in the left photo is above the vertical, that is, his nose is in front of the vertical line. But both of them are on the bit. and the haunches become active." 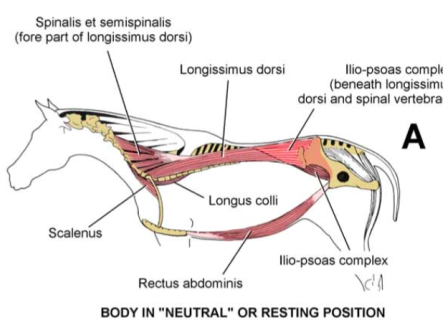 Dr. Deb Bennett, an expert in equine biomechanics, provides the following three excellent diagrams of how a horse's muscles are engaged when the horse at rest (A), resistant and tense (B), and on the bit (C). ​At this point, you might be asking why having a horse on the bit is so important, other than making the horse look nice. There are lots of reasons why. Horses that are ridden this way have strong top lines, which makes it easier and more comfortable for them to carry their riders--well into "senior" years. When the horse's back is raised, it is easier and more comfortable for the rider as well. 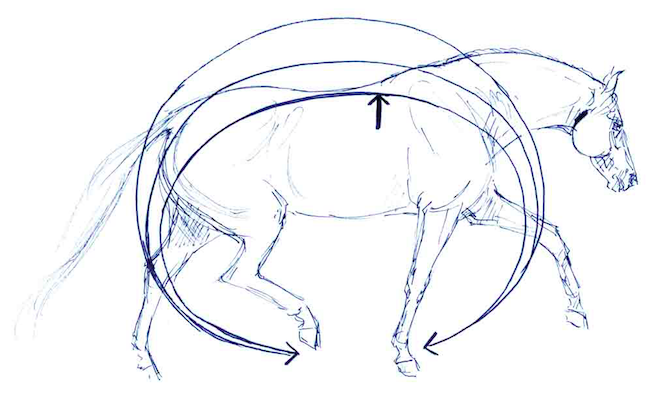 Sitting the trot or canter on a horse that is tense and "inverted" as in illustration B above is very uncomfortable. But most importantly, horses that are ridden this way are engaged not only in their bodies, but in their minds. They are in tune with their riders, and less distractible, and more responsive to the rider's aids. 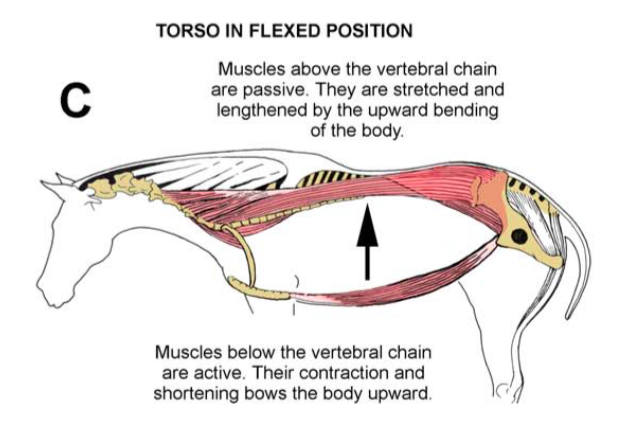 Here is an excellent brief YouTube video of Bernie Traug demonstrating the differences between riding a horse that is on the bit, resistant, and hyper-flexed (behind the vertical). Please don't ever ride your horse behind the vertical! You can see how uncomfortable it is for the horse!